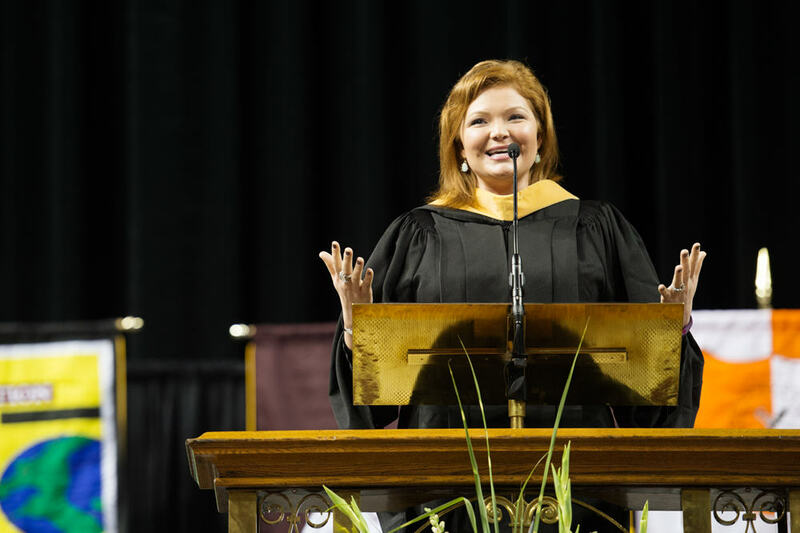 STARKVILLE, Miss.—International best-selling author Ashley Rhodes-Courter encouraged Mississippi State students attending Fall Convocation to step out of their comfort zones and translate what they learn in the classroom into powerful and productive actions. Students can show themselves and others what they are truly made of in the process, she said. Rhodes-Courter was the keynote speaker Tuesday [Aug. 16] as an estimated 3,700 first-year freshmen and 1,800 transfer students gathered for MSU’s third Fall Convocation in Humphrey Coliseum. The author of the university’s 2016 Maroon Edition common reading experience selection, “Three Little Words: A Memoir,” Rhodes-Courter shared those words of encouragement and other lessons she learned from her experience in overcoming troublesome early years in foster care. “You have such a unique opportunity here to experience things that you never experienced before. There are so many amazing adventures waiting for you,” Rhodes-Courter said. Born in 1985 to a single teen mother, Rhodes-Courter entered the Florida foster care system at age 3 and spent nearly 10 years in a series of foster homes—some of which were quite abusive—before being adopted at the age of 12. Despite the difficulties she faced, she excelled in school and, at an early age, became an advocate for children like herself who sometimes fell through the cracks in the foster care system. “When I would go to school, it was like my sanctuary. My education was something that I was going to have for the rest of my life. It was something that nobody could control, nobody could take away, nobody could beat out of me,” she said. In addition to exploring their academic abilities, students should take the opportunity to find their passion, Rhodes-Courter emphasized. Now a 30-year-old foster, adoptive and biological mother herself, Rhodes-Courter is a social worker who runs her own mental health agency that helps children in foster care. She became a New York Times best-selling author by the age of 22. “There are going to be situations in your life that seem so scary and so intimidating, and you’re going to feel like you are ill-equipped or you don’t know what to do. Sometimes, you just have to make that jump and go for it, and learn as you go,” she said. Rhodes-Courter said she never could have imagined the life she leads today. She expressed thankfulness for the dedicated individuals who have helped her along the way, as well as the chances she had to shine in the classroom and give back to her peers and volunteer. “My entire life I was told I would never go to college. My adoptive parents were told they would never find a foster child who was college-bound or who would be able to live up to their lifestyle or expectations. I took it upon myself to prove everybody in my life wrong,” Rhodes-Courter told her audience. Prior to Rhodes-Courter’s address, MSU President Mark E. Keenum, Provost and Executive Vice President Judy Bonner, Robert Holland Faculty Senate President Cody Coyne, along with Student Association President Roxanne L. “Roxie” Raven, officially welcomed the university’s new students to the Bulldog family. Raven also led the students as they recited the University Honor Code in unison, and each student received a Fall Convocation coin to commemorate the special occasion. Keenum, who holds three degrees from Mississippi State, encouraged students to take advantage of the university’s resources designed to help them grow and reach their full potential. Bonner echoed these sentiments and told students they will have opportunities to become involved in learning activities outside of the classroom to supplement and reinforce concepts and skills from their studies. Study abroad, undergraduate research, service learning, student leadership, internships and co-oping all are ways for students to augment the learning that takes place in the classroom, she said. “I hope you will leave this convocation inspired knowing that you will be successful at Mississippi State and in life,” Bonner said.